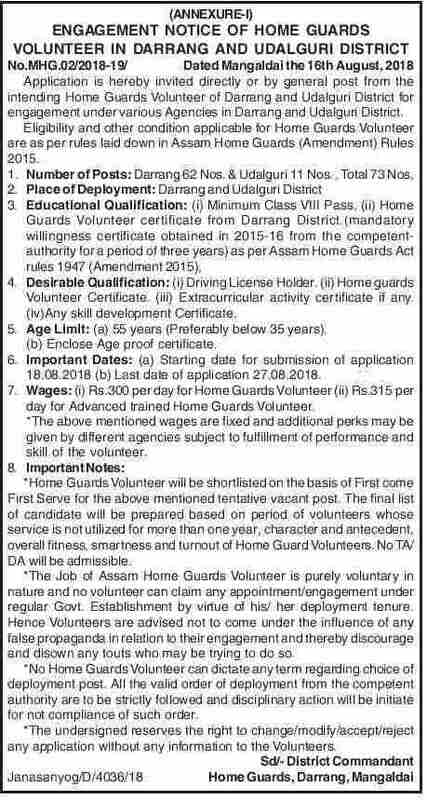 Home Guards Recruitment 2018 at Darrang and Udalguri Districts – Application is hereby invited directly or by general post from the intending Home Guards Volunteer of Darrang and Udalguri District for engagement under various Agencies in Darrang and Udalguri District. Eligibility and other condition applicable for Home Guards Volunteer are as per rules laid down In Assam Home Guards (Amendment) Rules 2015. (ii) Home Guards Volunteer certificate from Darrang District. (mandatory willingness certificate obtained in 2015-16 from the competent authority for a period of three years) as per Assam Home Guards Act rules 1947 (Amendment 2015). (ii) Home Guards Volunteer Certificate. (iii) Extracurricular activity certificate if any. (a) 55 years (Preferably below 35 years). (i) Rs.300 per day for Basic trained Home Guards Volunteer. (ii) Rs.350 per day for Advanced trained Home Guards Volunteer. Home Guards Volunteer will be shortlisted on the basis of First come First Serve for the above mentioned tentative vacant post. 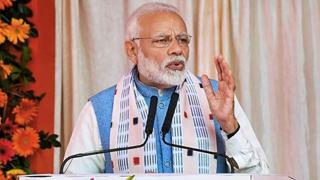 The final list of the candidate will be prepared based on the period of volunteers whose service is not utilized for more than one years, character and antecedent, overall fitness, smartness and turnout of Home Guard Volunteers. No TA/DA will be admissible.